Last fall, we built a deck for our home, but since snow began falling soon after, we never had the chance to use it. All winter long it has been sitting empty, and I have been waiting expectantly to finally be able to furnish & decorate our new outdoor space! After doing a little shopping at my local Urban Barn store, I found so many seaside inspired pieces that I absolutely fell in love with. From rope detailing to ocean blue hues, nautical details are majorly on trend this season. Once I found this classic teak outdoor dining set everything else fell into place and our patio quickly transformed from an empty wooden deck into a romantic beachy retreat. Of course, the best way to break in a new space is by throwing a party. So, inspired by the colours of the ocean (with a little blush pink thrown in for good measure!) 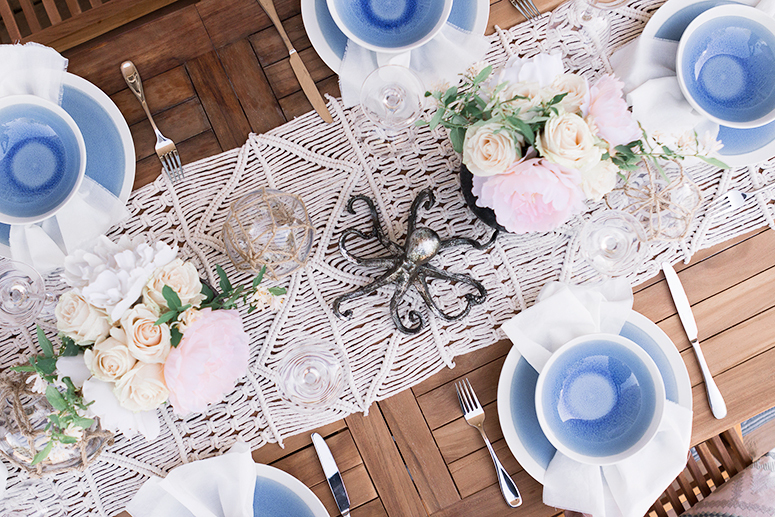 a seaside inspired dinner party took shape. 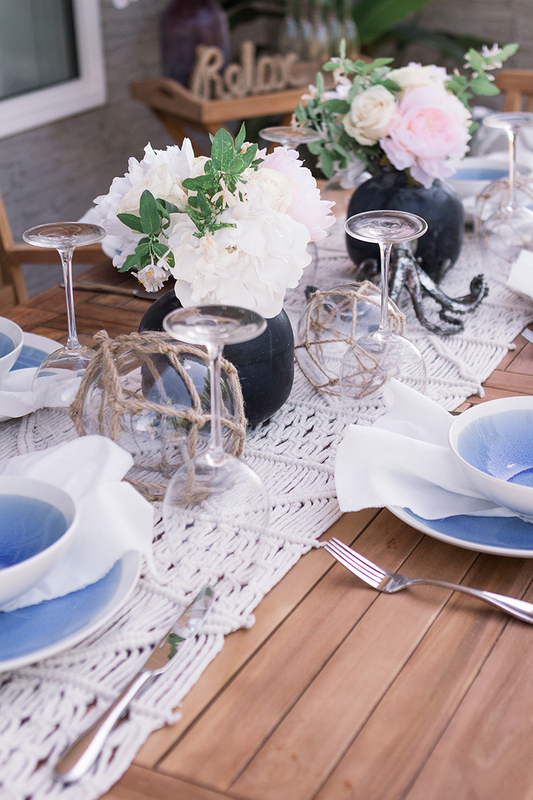 When throwing an outdoor dinner party, there are a few things you should consider. First of all, the comfort of your guests is the most important thing. Although most pillows aren’t weatherproof, it’s worth bringing a few cozy cushions outside when guests are over. Not only do pillows add a ton of colour and texture, but they will make your outdoor furniture that much more comfortable. Meaning your guests will want to linger long after dinner is finished instead of rushing to leave. Another consideration when hosting an outdoor party is that you need to choose decor that is heavy enough to withstand the occasional breeze. You definitely want to stay away from taper candles and tall glass vases. Instead opt for heavier decor pieces with a lower centre of gravity. 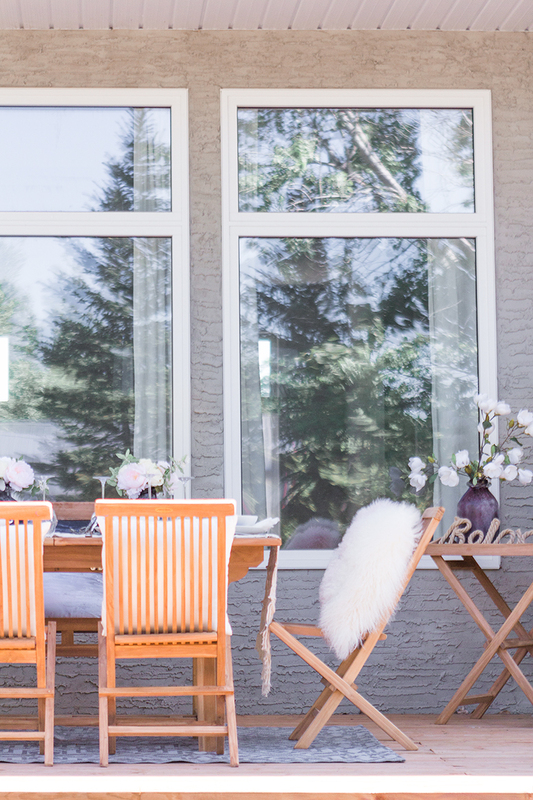 The dark frosted glass vases I chose are absolutely perfect for an outdoor party since you never have to worry about them getting knocked over by the wind. When decorating an outdoor space it’s easy for your decor to get visually lost within the vast space of the great outdoors. The best way to create a defined space and centre your decor is by layering a great rug underneath your table. I only recently discovered outdoor rugs, but they are amazing! Instead of being made of a heavy wool that would soak up any bit of moisture, outdoor rugs (like this one!) are made of a durable polypropylene that can withstand the elements while still adding all the texture of a traditional rug. 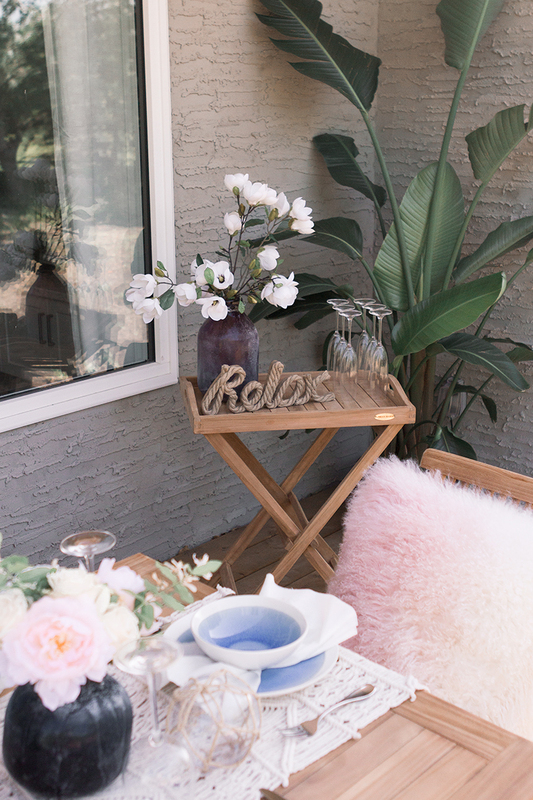 I hope you enjoyed today’s peek into my new patio space and all my tips for hosting an outdoor dinner party. I’d love to know what you think! 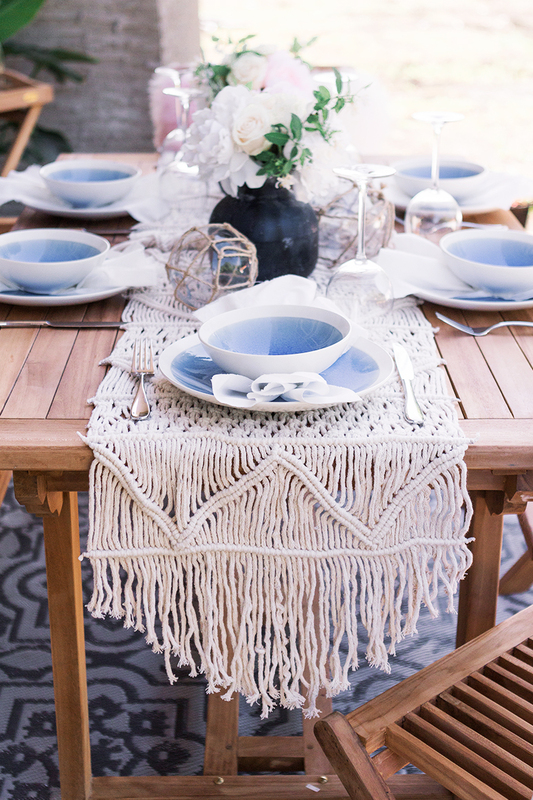 Have you ever thrown an outdoor dinner party before? 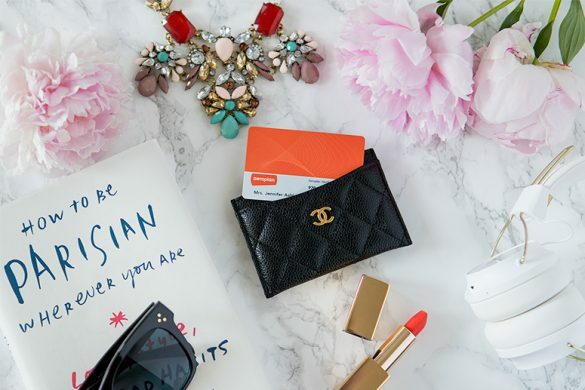 Make sure to share any tips you’ve learned by leaving a comment below! I love the tableware you used. The beautiful blue color is right up my alley! 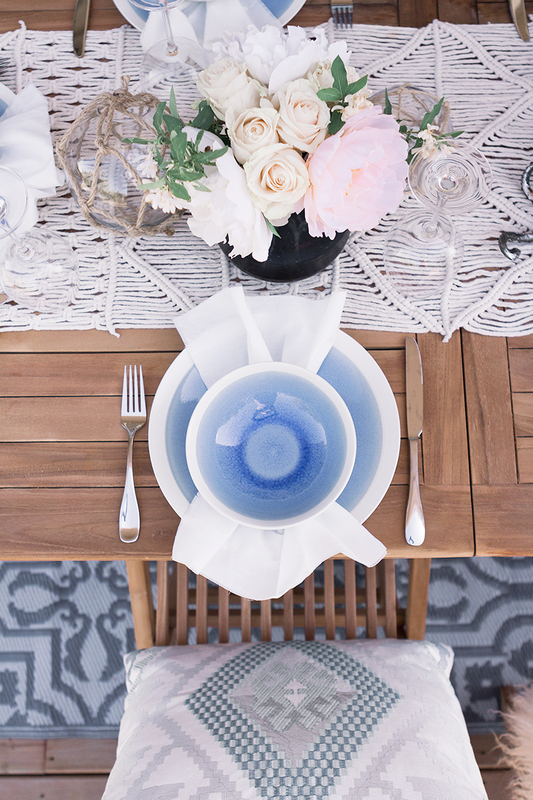 Your tablescape is absolutely beautiful! I’d love to be a guest in your garden. OH MY GOSH! This is perfection! I have never had an outdoor dinner party but this is certainly inspiring! Love your table setup! 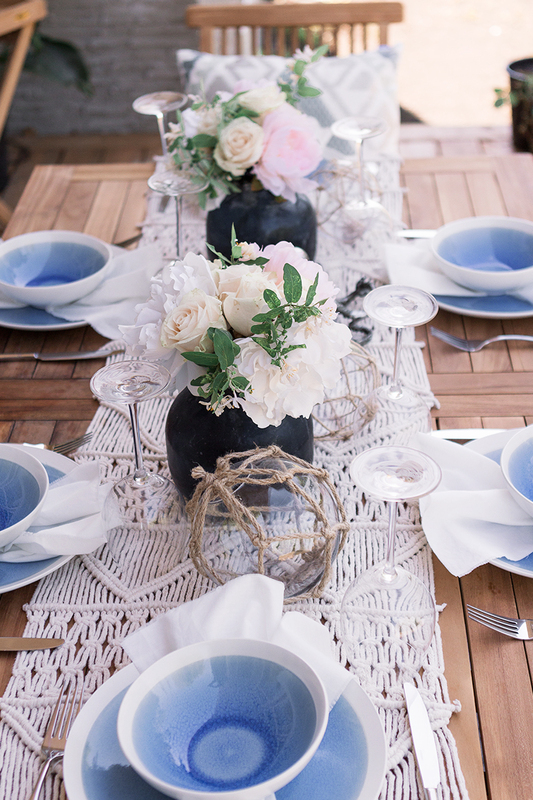 That table runner is so pretty and I love your dishware! Omg, those bowls look amazing!!!! and your patio is my dream!!! Your photos are so Pinterest worthy!!!! Sounds like a great time. This couldnt look more perfect! So in love with this set up! 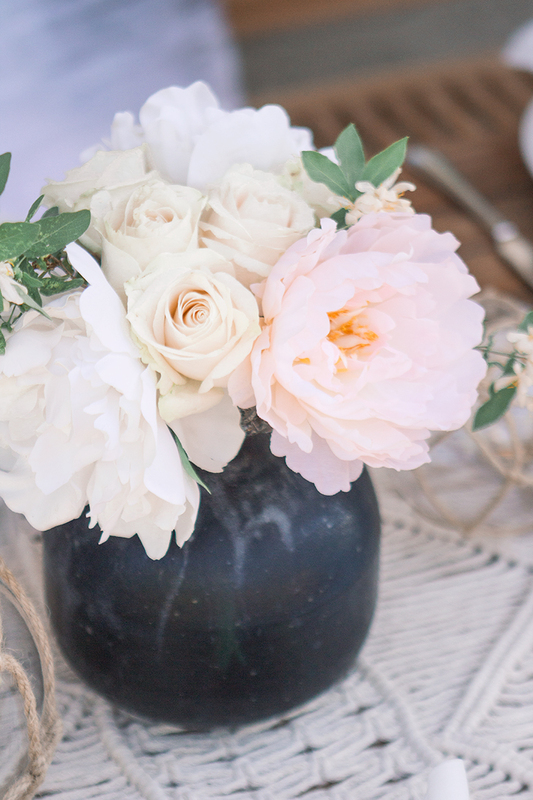 This tablescape is so pretty! I love the blue color! 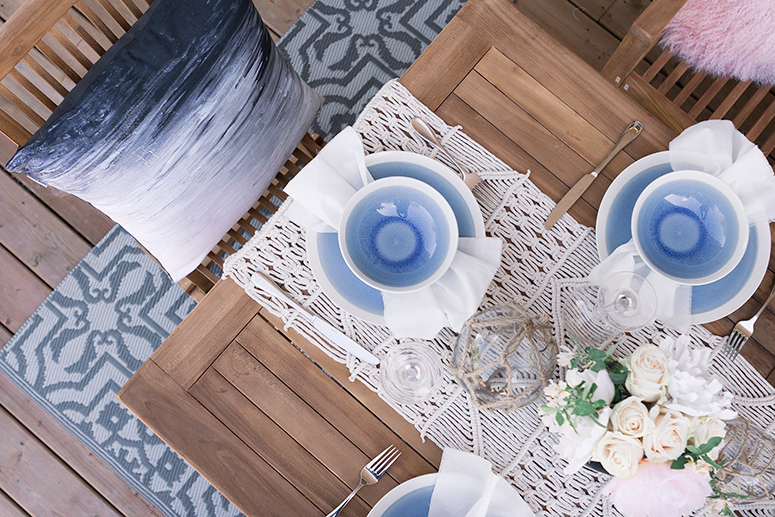 In love with your patio and this table setup, so beautiful! This set up is BEAUTIFUL! I love the color pallet! I love your styling aesthetic! 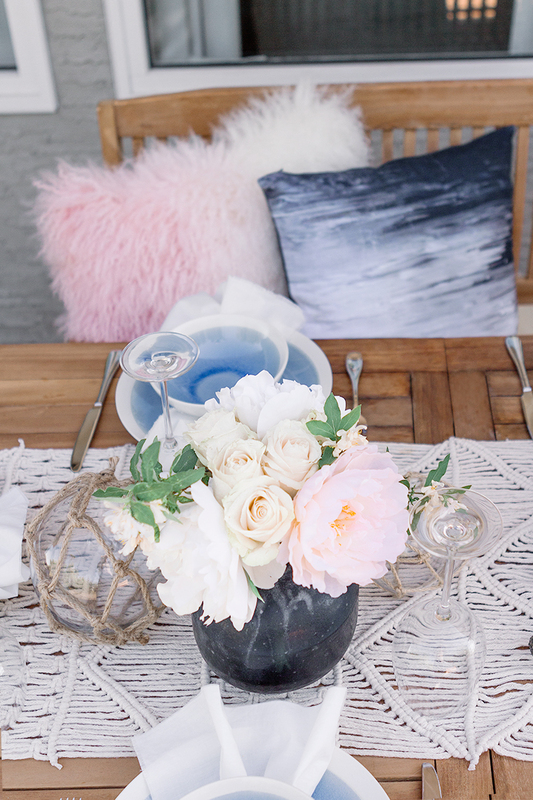 I never would have thought to do pastels for a beachy theme dinner party! So romantic and elegant! Love the table setup. It’s beautiful.